Bob was born in Winston-Salem, North Carolina in 1942. He was an Assistant U.S. Attorney from 1968-1972; Associate Municipal Judge for the City of Charleston from 1974-1976; and Assistant Corporation Counsel for the City of Charleston from 1976 to present. Bob was one of the founding partners of Clawson & Staubes in 1975. 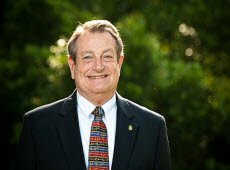 Bob has practiced for many years in the area of insurance defense litigation and has tried many cases throughout South Carolina in both state and federal court. Bob was the Chairman of the Charleston Area Mental Health Commission from 1980 – 1982. He was the President of the South Carolina Municipal Attorneys Association from 1983-1984. Bob is now of counsel to the firm and provides valuable insight and guidance to young attorneys. Bob was an accomplished runner until knee surgery slowed him down. He completed three marathons including the Marine Corps Marathon in Washington, DC and more than 30 half-marathons. Bob also enjoys scuba diving and has more than 500 dives in the Americas, including the Wreck of the Rhone in the British Virgin Islands, and the Devil’s Throat in Cozumel, Mexico.